I’ve got a confession to make…I don’t really like people. I act like I do, smiling when I meet someone new and playing the social butterfly at blogger conferences but in truth I’ve never been much of a people-person. I don’t hate people, ok maybe some people, but I love being able to work alone. In an increasingly socially-connected world, it’s becoming more difficult to find a job for people that hate people. Employers expect you to play nice with customers, co-workers and even that boss that doesn’t know what the h&*! he’s talking about. You don’t even need to hate people to want to avoid them. A lot of people are just natural introverts and want to work alone. Fortunately, there are still ways to make money with different levels of social interaction. You might not be able to avoid all people, all the time but there are jobs that will avoid the most annoying people. I’ll cover some traditional jobs without much personal interaction first before some of the new economy jobs online. Whether you hate people or just dislike some people, just about anyone can appreciate a little space at their job. Picking the best job for your personality means understanding what it is about people you don’t like and which people you want to avoid. Do you not want to mess with customers? Are you tired of office politics and the constant back-stabbing among coworkers? Are you just tired of having to answer to an idiot manager? Maybe you’re fine with all these people but you just can’t stand people during your commute to work. Looking through the list of jobs for people that hate people, ask yourself what type of people you’ll avoid and what people you’ll still have to deal with every day. I used the Bureau of Labor Statistics 2016 National Occupational Employment and Wage Estimates data for average hourly wages. There are a lot of regular jobs that don’t involve a lot of social interaction. Obviously we’re not talking about anything in retail and probably not marketing but there are many back-office jobs you might enjoy. Actuary and corporate accountant – Either of these will still involve some interaction with coworkers…but who wants to talk to an accountant? My first real job after college was as a Financial Reporting Analyst (yeah, I liked the title better than corporate accountant). I had a cubicle at the end of the row and up against the wall so nobody ever made it there unless they had something important to say. You’re going to need a degree for this kind of work but the median pay is around $55 an hour. If you don’t have the degree, you might look to some kind of bookkeeping as an alternative which can still bring in nearly $20 an hour. Archivist is like a librarian but at a museum or records place not necessarily open to public. Your job will be to process, catalog and preserve records and documents. This is going to put you far away in the basement or stacks of records. You may or may not need a degree for these, depending on the experience needed in a specific field. For basic record-keeping jobs, you can get something with little or no experience and enjoy working alone all day long. Average earnings are between $17 an hour for librarians and records-keeping to $25 an hour for archivists. Video editors do their work after all the filming and in a little room where you can kick people out and say, “I need to concentrate.” You’ll need to know how to use video editing software like Apple Final Cut or Pinnacle Studio. You can edit a few of your own videos to use as portfolio examples before applying. Average earnings are around $40 an hour. Astronomers have the ultimate job for people that don’t like people. Observatories are usually high up on a mountain and you’ll work at night when everyone else is asleep. Even if you don’t work at the observatory, you’ll be working in front of a desk-full of computer screens. 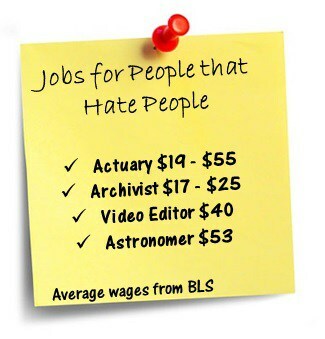 Working as an astronomer can pay six figures with an average hourly of $53 but the downside is that you’ll need a degree and maybe even a higher degree. Statisticians or really anyone in a math-based occupation have all the workings of a great job away from other people. I love math. It’s the language of science. Most people don’t share that passion and aren’t going to want to talk about those cool statistics you’re working on. You’ll mostly be working in front of a computer, running simulations and checking back on the math you should have learned in school. Median wages run between $35 and $45 an hour. The online revolution has made it possible for people to build entire companies without interacting with others. While even the most solitary traditional jobs will still require you to work in an office and answer to a boss, a lot of online jobs can be done from home and with infrequent contact with anyone. 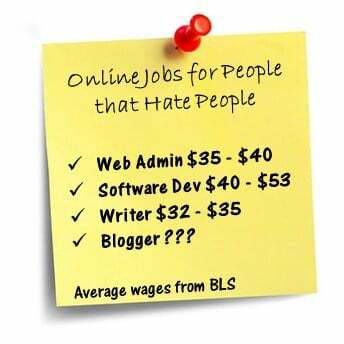 In fact, even for people that hate people, some online jobs can even be too solitary. I love being able to get out of bed and be ‘at the office’ within 30 seconds. I don’t have to sit through useless meetings or fill out an annual evaluation report. On the rare occasions I want to work around other people, I join a co-working space for a few days. The level of interaction with other people will vary depending on your online job or business. You might have customers or an editor that you talk to regularly. You might still have to answer emails, some relevant and some inane, but there are ways to manage your interactions and you almost never need face-to-face meetings. It’s not necessarily a job itself but you can freelance just about anything done in a traditional work environment. Employers are slowly opening to the idea of employees telecommuting a day or two every week and some companies are hiring freelancers that work independently. Website administration is slowly shifting from an in-house job to one even larger companies are outsourcing. You can manage smaller pieces like SEO, security, content strategy or manage the entire website for someone. You’ll need different skills depending on which parts of the website you manage which is why most newbies start with smaller sites or put together a team to manage large sites. Whatever you do, just don’t get stuck answering the phone as the IT-person! Software developer can mean independently creating applications for use on consumer electronics, as a game developer or working as part of a larger group of developers for a company. Median income starts around $30 an hour but can go well into a six-figure annual salary. Obviously an independent developer is going to have much less interaction with other people but you’ll still need to talk to other developers to stay up-to-date and create in-demand apps. I’m breaking writing out into two categories here because there’s two very distinct jobs for people that want to work alone. Self-publishing books for sell on Amazon is the most solitary of the two forms. 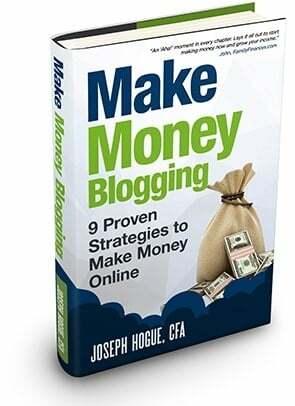 I’ve self-published ten books and make an average of $2,000 a month through Kindle, paperback and audio sales. Self-publishing means you don’t have to talk to editors and you don’t have to go on marketing tours like you would a traditionally-published book. 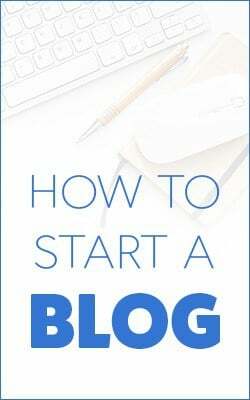 There’s an entire category on the blog devoted to self-publishing so we won’t go into the specifics but it’s a great job for people that don’t like to work with others. Content writer or freelance writing is still something you can do with relatively little interaction with others but you’ll need to work with editors and sources. There are different types of freelance content writing with different levels of interaction. Web content writer is creating articles to publish on websites. The owner or editor will either give you content ideas or you’ll pitch ideas yourself. You may have to reach out to get quotes from others for your stories or it may not be required. Freelance journalist will involve quite a bit more interaction because you’ll need to constantly manage sources and reach out to people to get fresh stories. Sales copy writer involves writing marketing material for publication and won’t usually require sources for quotes but you will have to talk with people in the company to get input. Ghost writer will usually involve somebody else getting input from other sources and you just writing everything. You won’t get credit for writing the article but you’ll still get paid. 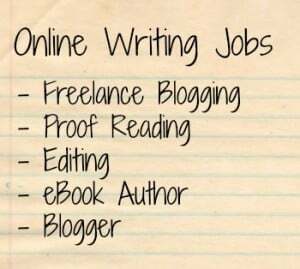 Blogger or website owner is a little bit of many of these jobs including writer and website administrator. I’ve had my own sites for nearly three years now. It’s not the get-rich job a lot of people imagine but I make over $5,000 a month and income has doubled every year. Technically you could do everything yourself but most bloggers I know outsource some of their work. That means you’ll still need to work with other freelancers and being active in a blogger group is critical to growing your site. 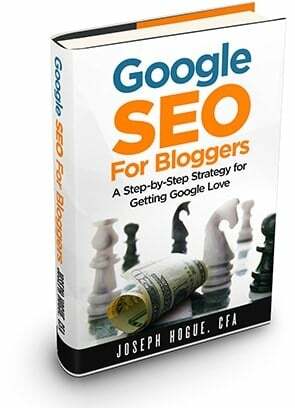 Get started with this resource guide on 57 blogger mistakes and how to succeed. Amazon FBA is like starting your own retail company but without having to rent a shop at the mall. I highlighted the work-at-home retailing alternative in another post but basically, you contract with a manufacturer to produce your product and ship it to Amazon’s warehouses. You manage your Amazon product pages and do some marketing to produce sales with Amazon taking care of all the shipping and billing. 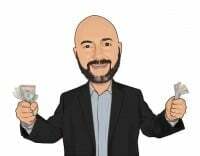 It’s an extremely stream-lined way to own your own company and I know several people that have turned just a few products into $100,000+ annual incomes in less than a couple years. Even most of these online jobs will still have some form of personal interaction depending on how much of the process you outsource or seek outside help. Even for people that don’t like to work with others, some of these online jobs can be so solitary that you’ll look forward to the infrequent conversations with others. Not liking other people doesn’t make you a bad person. Nobody likes the endless meetings, meaningless co-worker chatter and other problems that come with forcing people to work together for eight hours every day. You may never find a job with zero personal interaction but you might not want that either. Finding something that suits your personality is just a matter of knowing what’s out there.